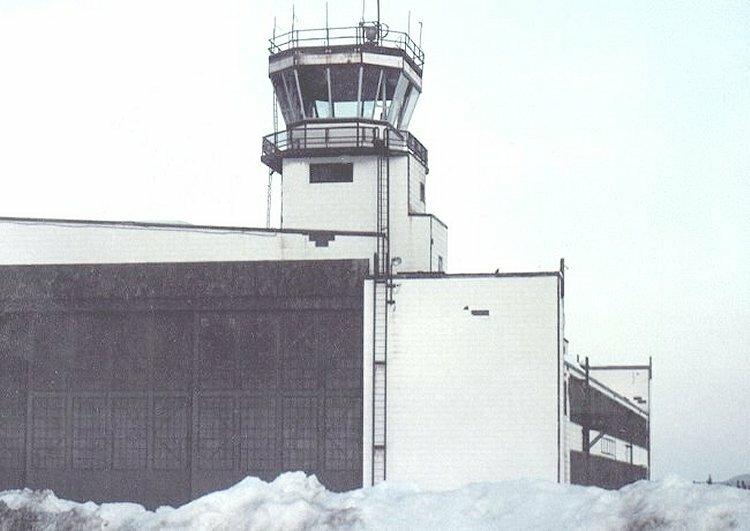 Old RCAF control tower (part of RAF hangar) - May 1984. 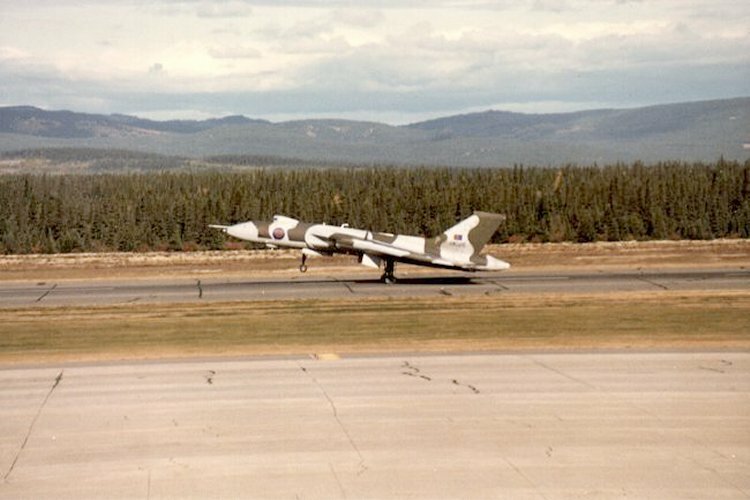 RAF Vulcan bomber landing - September 1982. 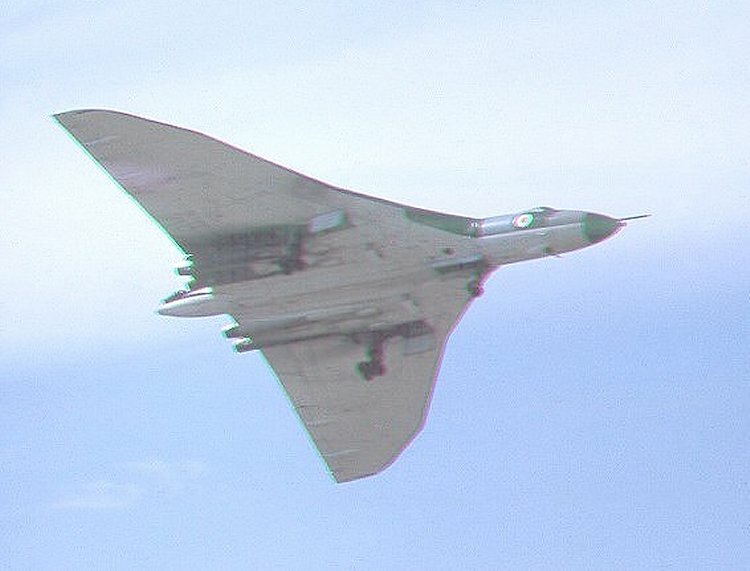 Royal Air Force (RAF) Vulcan bomber on departure - July 1973. 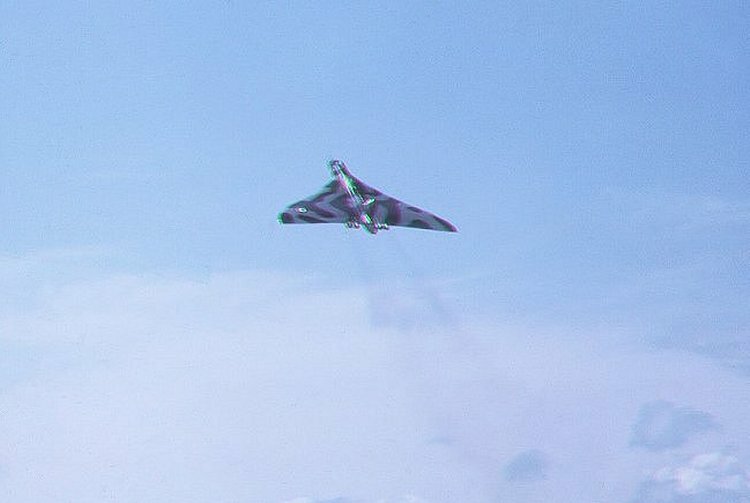 RAF Vulcan doing a low pass over the airfield - July 1973. 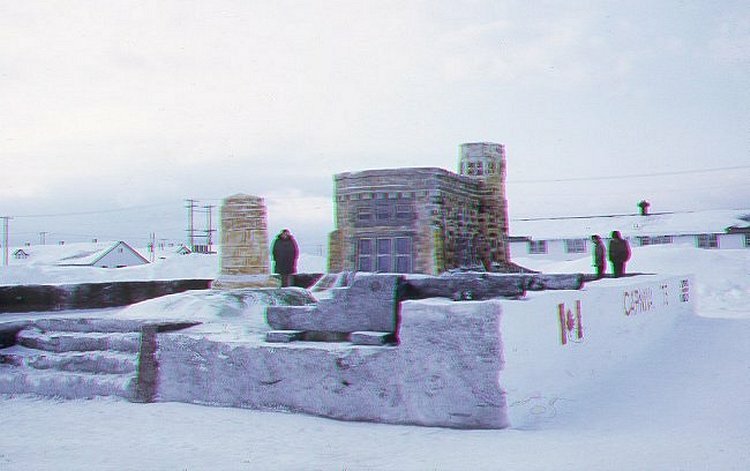 Bulldog (RAF) Club snow sculpture in the Winter Carnival - February 1973. 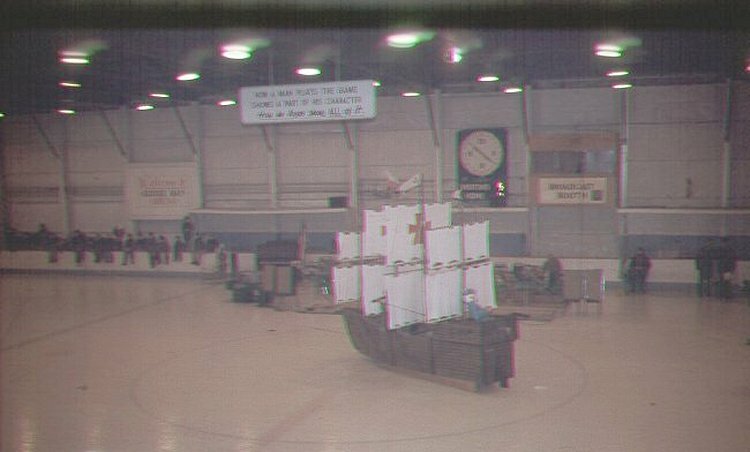 Bulldog (RAF) Club skit in the Winter Carnival at the CAF arena - February 1973. 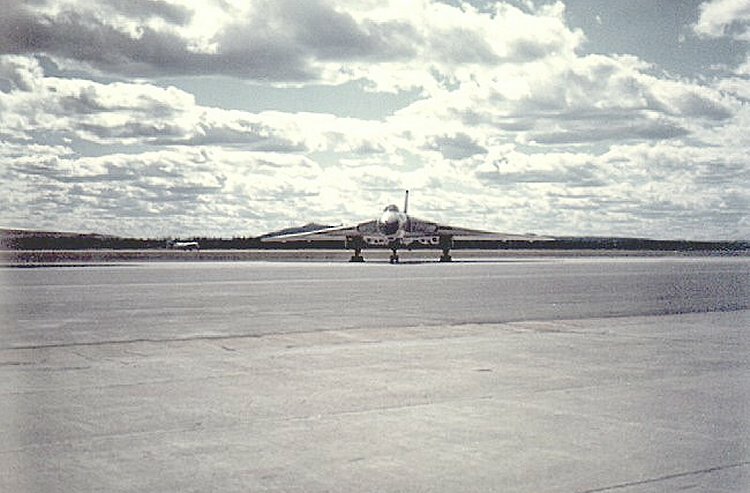 Vulcan bomber on the RAF flight line at Goose Bay - August 1970. The "Jinx" band at the RAF Bulldog Club - November 1969. 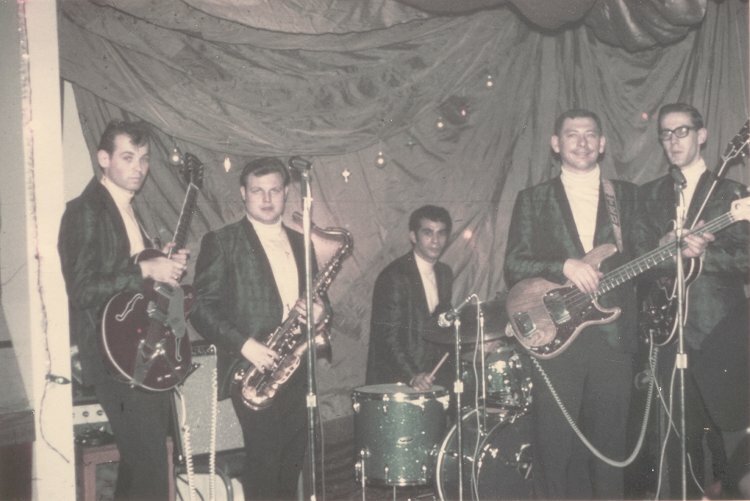 (L-R) Nelson Lyon (CAF - guitar), Tom Carl (USAF - Tenor Sax), Barry Parent (MOT civilian - drums and vocals), Ted Olsen (USAF - bass), Ren L'Ecuyer (CAF - guitar). 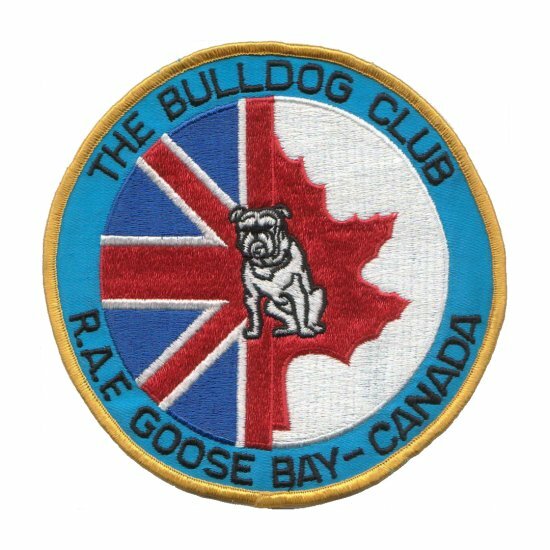 RAF crest for the "Bulldog Club" - June 1969. 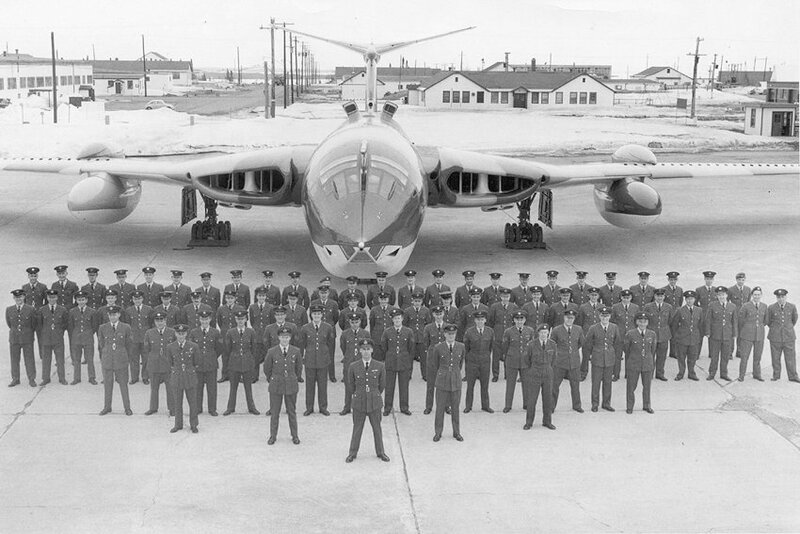 RAF detachment personnel in front of a Victor - April 1965. Larger image of the RAF personnel in the previous photo - April 1965. 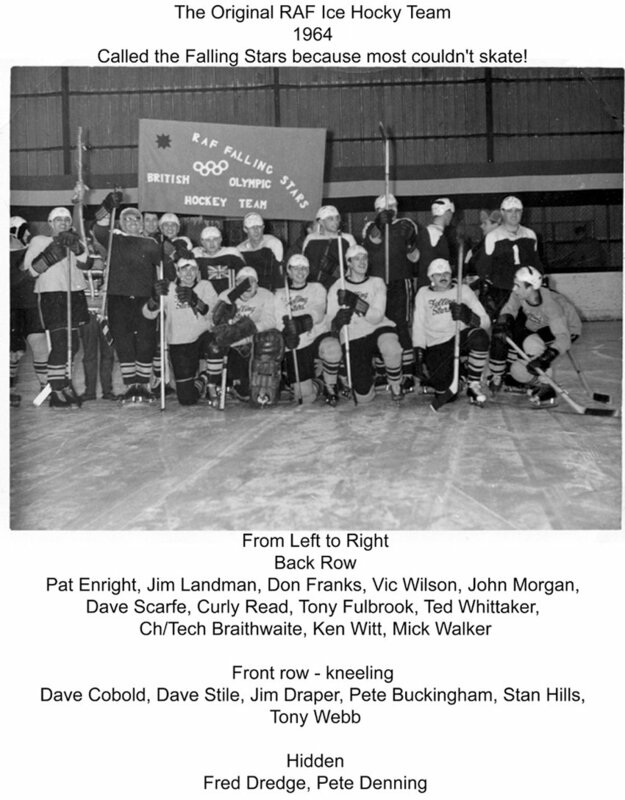 Jim Draper - second row from rear, 9th from left. 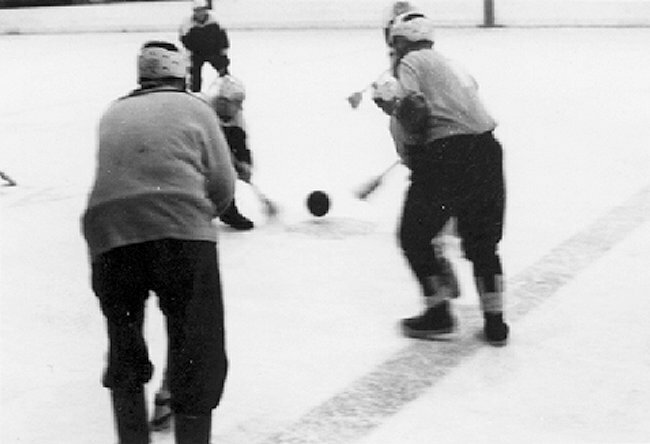 Broomball proved to be much safer than ice hockey - February 1965. RAF "Falling Stars" - November 1964. 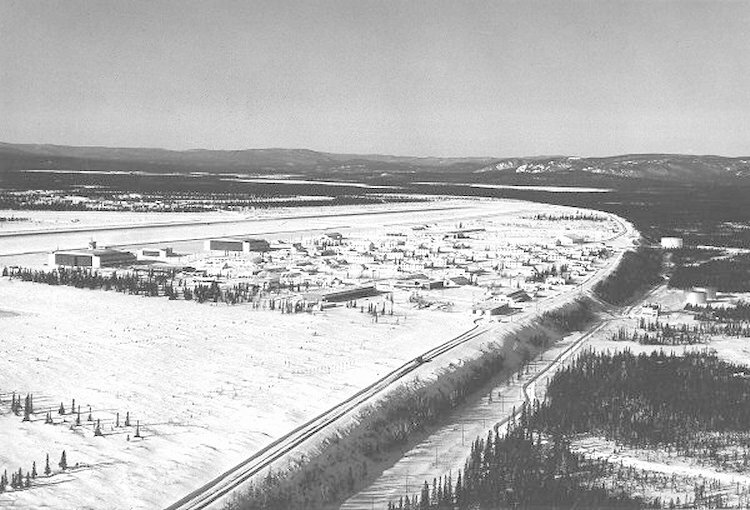 Aerial view of Goose Bay - January 1964. The RAF operated from the hangar by the control tower. 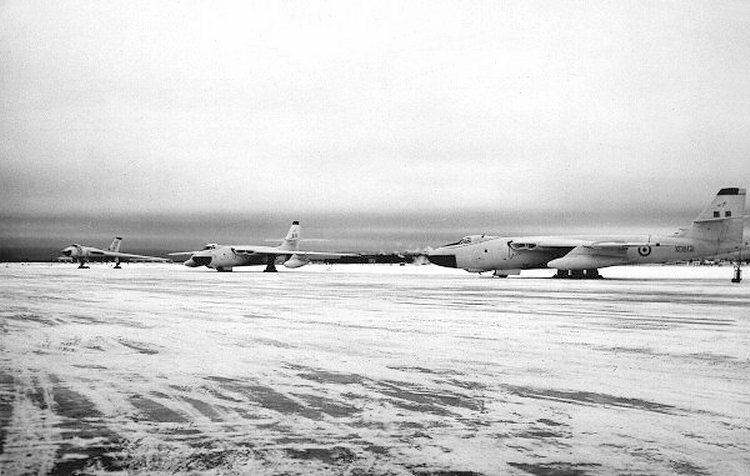 Flight line on the Canadian side at Goose Bay. 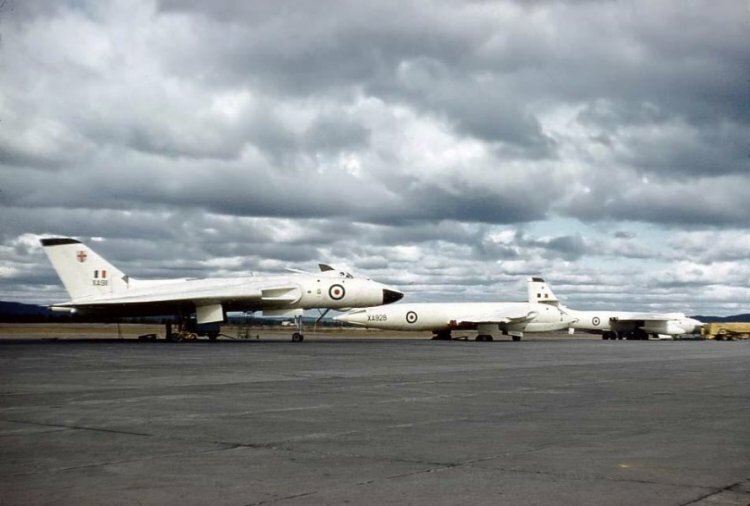 Vulcan (left) and two Valiants of RAF Bomber Command - January 1964. 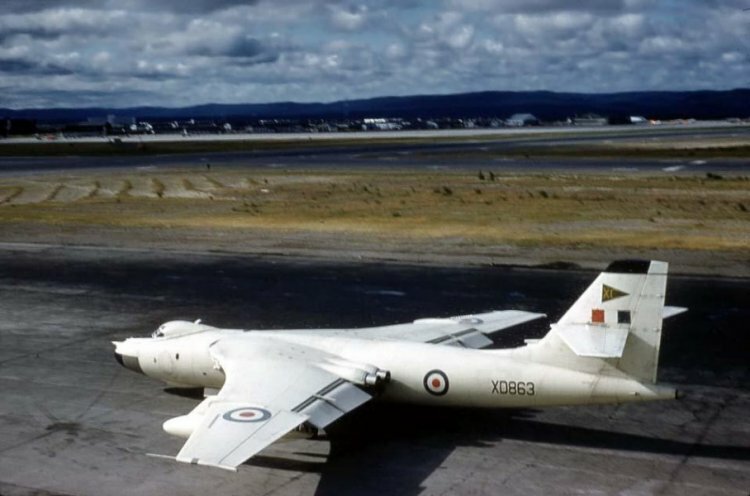 Royal Air Force (RAF) Valiant bomber parked on the ramp on the Canadian side - March 1960. 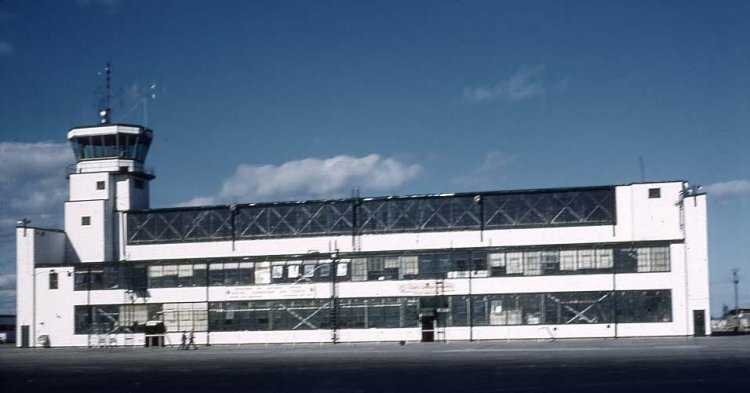 The hangar was used by the RAF for their aircraft - July 1959. The control tower was manned by RCAF personnel. RAF V-Bombers on the ramp - July 1959. 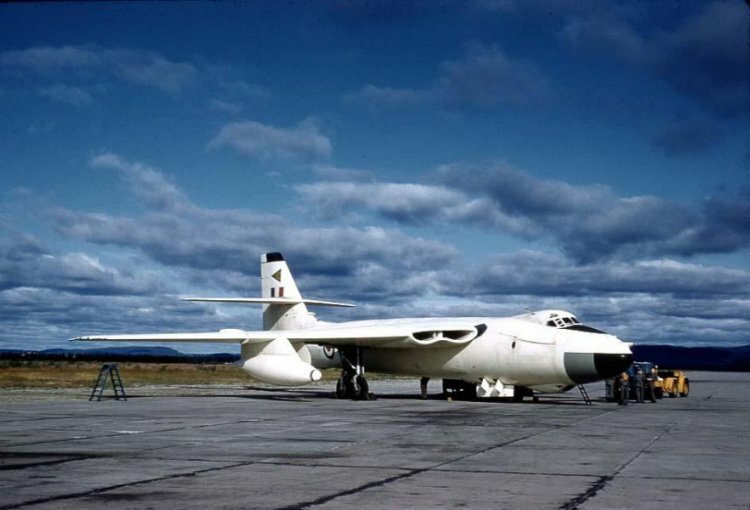 Goose Bay was a staging post for Englands V-Bombers, the Victor, Valliant and Vulcan. An RAF Valiant bomber taxis by the control tower - July 1959. 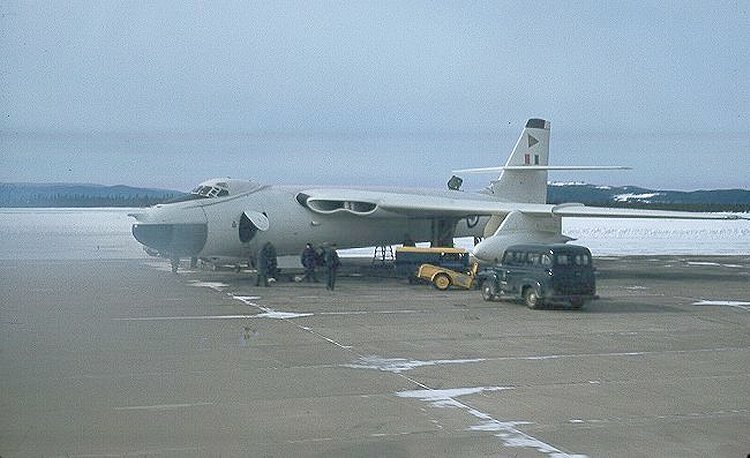 RAF Victor bomber - July 1959. The ground crew have removed the tail cone, probably to refit a drag chute. 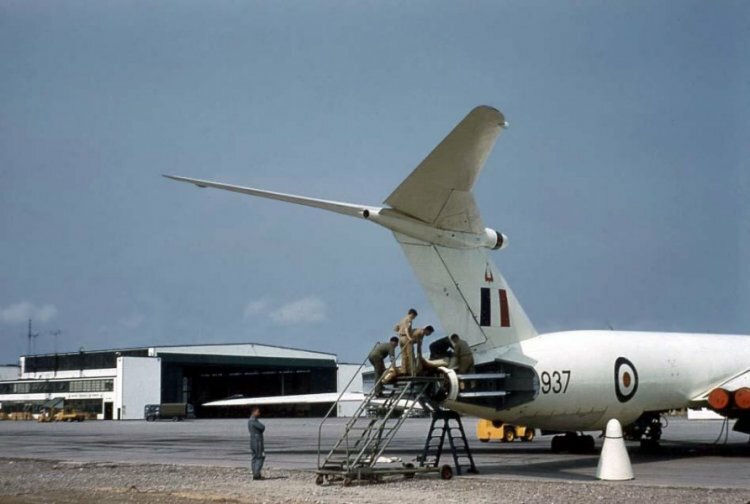 RAF Valiant bomber on the ramp - July 1959. 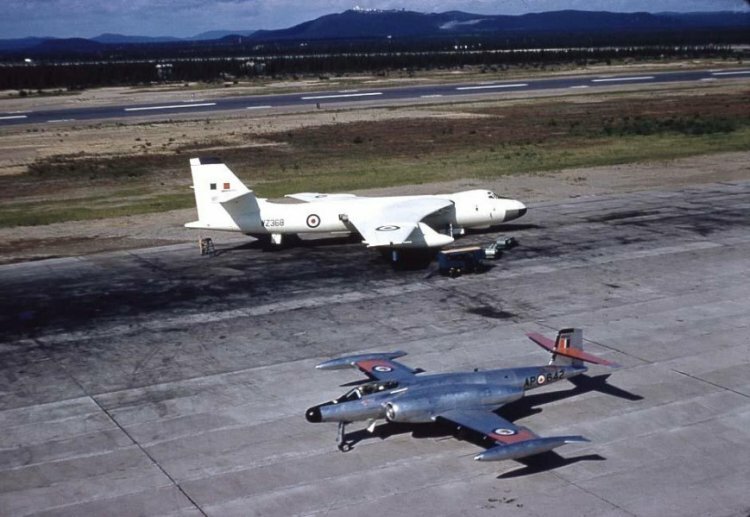 RAF Valiant and an RCAF CF-100 - July 1959.